All of my research typically starts with a theory of how I can break something, or a point that I want to prove. This research all started with a general theory - I believe there are non-public IPC messages and protocols being used within Apple developed applications (and the core OS). In order to examine this theory, I wanted to go as low-level as possible when examining the OSX IPC mechanism. There has been some minimal research done on OSX IPC, however I have not seen any go as low as the mach layer. Most research I have seen examines the XPC layer and above (more on how this all fits together later). The obvious first question I had when attempting to prove/disprove my theory was - how does IPC work in OSX? The answer I received was roughly: “oh, through mach messages and XPC and IOKit” but thats about as much detail as I received. There is not a ton public information on the mach layer (apple developer, outdated book, sample code), however there is source. OSX IPC is based on mach messaging, which are part of the XNU portion of the kernel, which is open source (tarball - github). Mach messages are sent via kernel traps. The lowest function call, prior to calling the kernel trap, to send messages is the mach_msg function. Mach message source/destinations are referenced via “ports” which are just unsigned integers. Mach ports are process specific. IE: the mach port/integer for “networkd” in Chrome does not necessarily equal the same mach port/integer in Safari. Ports can be “looked up” similar to how DNS resolves a hostname to an IP address via bootstrap. In OSX, bootstrap is launchd. Applications register with launchd/bootstrap similar to inted on linux. The kernel is the source of truth for what mach port number represents what destination and visa versa. Communication to launchd/bootstrap is performed via IPC. There are “special” ports that the kernel is aware of, and can be returned via function calls, without looking them up via bootstrap. Apple OSX IPC is moving towards using XPC as a transport framework. Almost all IPC built-in to OSX is all based on mach messages. When someone says they are using IOKit, or XPC that all funnels down to eventually using mach messages to transmit data between applications. Mach and XPC have a similar relationship to IP and TCP. In IP/TCP, an IP packet has a structure with an arbitrary data payload. That arbitrary data payload can be of type TCP, which has its own structure. 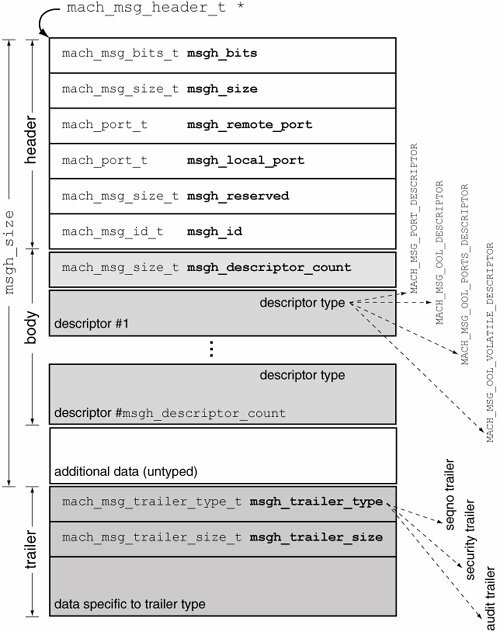 In mach/XPC, mach has a structure with an arbitrary data payload. XPC is the arbitrary payload within the mach message. More specifically, XPC is a general [de]serialization approach to transmit data. *  Every message starts with a message header. So, when examining a raw pointer to a message, you first have the mach_msg_header_t then if MACH_MSGH_BITS_IS_COMPLEX(msg->msgh_bits) == true there is an unsigned int with the number of descriptors, followed by the descriptors, followed by the raw data. If that IS_COMPLEX is false, there is just raw data following the mach_msg_header_t. What does your mach look like? As of OSX 10.10.1 kernel extension signing is enforced. In order to bypass this, you must disable kernel extension signing in nvram (sudo nvram boot-args=kext-dev-mode=1) - I didn’t want to do this on my main machine for security purposes, so all kernel dev was done on a VM. Very annoying. Kernel extensions don’t have the fancy schmacy libraries like normal applications do - for example, there is no fopen. Even more annoying. In order to export data, kernel extensions typically interact with a user-land application to do helpful things like…. write to files…. or print data to stdout…. This increases development overhead like 1000 times. At this point I was done with kernel extensions. Ok, no more kernel extension, and this is where I almost gave up, until I realized that every IPC should/must filter through the mach_msg function. I knew Linux had the ability to perform function hooking via LD_PRELOAD, and discovered a similar concept exists in OSX via DYLD_INSERT_LIBRARIES. And, the mach_msg_header_t structure is defined in the image in the previous section. // back. If this is set, we assume there will be a response. It seems as though the first thing the command does is trying to interact with com.apple.CoreServices.coreservicesd which would make sense. You can also see the string “!CPX” which looks like some magic header for an XPC serialized message. You may also be wondering what the ‘mach_shark’ command is that I ran in the screenshot. I created a generalized tool to intercept IPC messages that will be available soon. Note: There are other functions used to send mach messages, like mach_msg_send which just calls mach_msg. I assumed that if I just hook mach_msg, my hook would be triggered when mach_msg_send was called, however that is not the case. You will have to hook all functions where the target application will be sending messages. I am not completely clear why, but I assume it has something to do with the fact that mach_msg and mach_msg_send are both located in libkernel.dyld, and the library doesn’t have to look up the dynamic address based on name of the function, which is how the DYLD hook is triggered? The other thing to keep in mind is something I referenced above: Mach ports are process specific. IE: the mach port/uint that represents “networkd” in Chrome does not necessarily equal the same mach port/uint in Safari. Similar to file descriptors - if you open file X in process A, you are returned an integer. If you open that same file in process B, you may receive a different integer. Fortunately, the first message displayed above is sent to bootstrap which can be directly queried by the function call task_get_bootstrap_port. My first idea was to just simply cast the raw data of a message back to a mach_msg_header_t and call mach_msg on that pointer, however that triggered a failure (for still unknown reasons). 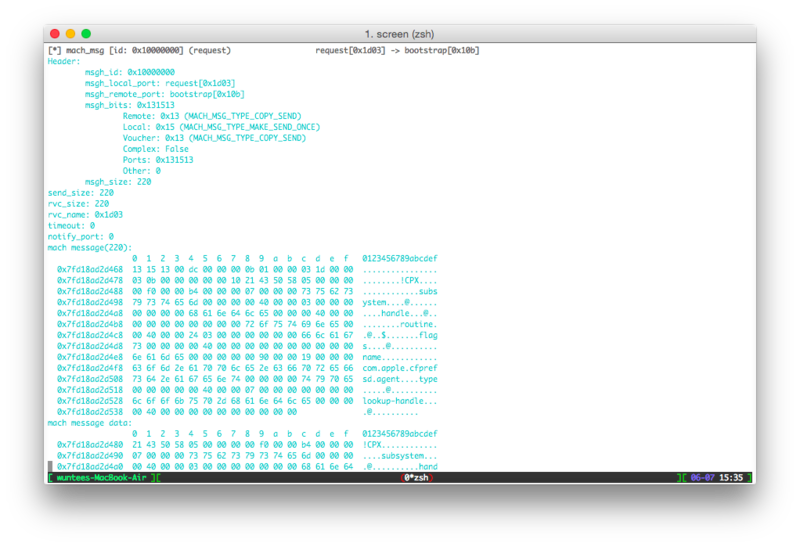 What did end up working, though, was to cast the data to a mach_msg_header_t and then re-set that struct’s variables. The following snippet will successfully replay the message. However, since the message gets a response, this is only half of the conversation. I have yet to examine the difference between the original message and whatever happens after I re-set the message attributes, but it made no difference to me, as I could now at least interact/replay messages at the mach layer. More importantly, I can start fuzzing message contents to bootstrap/launchd! A simple bit flipping fuzzer has led to about 5 unique crashes. I am still working on diagnosing two of the three, but will hopefully have a chance to give details out on the ones I have reported in my next post. In the above example, we are only sending a message to launchd/bootstrap. This is the simplest of mach interactions because you can obtain the port number directly via the task_get_bootstrap_port function call. But, how do you send messages to other running daemons?! Since we can’t just insert the port number in the packet we are re-playing (since we are in a different process), how do we obtain the correct port for the service we want to talk to? How do we know exactly (string representation) what service the message is being sent to? Kernel extension - Since the kernel is the source of truth for much of the IPC and port information, why don’t we create an extension that I can look-up the PID/port_id and get back the string representation? Unfortunately, this is harder said than done. launchd is actually the process that contains the port string that is used to register the application and eventually the port_id. In the kernel, the most I would be able to obtain is the PID of the destination process (and in turn the binary location). This doesn’t help, because bootstrap_look_up requires the ‘com.apple.blah.blah’ type name to look-up. Launchctl print - There is a nice method within launchctl that provides you exactly what I am looking for - the string representation to port_id mapping. You can see this by running the command sudo launchctl print pid/[PID_HERE]. I didn’t want to execute an external command and parse stdout, so I started to reverse how launchctl does this. launchctl sends an XPC message to launchd, containing a file descriptor to stdout, which launchd ends up just printing the information directly to. FTS. MOAR HOOKING - Why not just hook bootstrap_look_up and keep a mapping of the lookups? This is the first thing that kinda worked. Unfortunately, this is not the only way that ports are looked-up. After doing a bit more of reverse engineering on launchctl and some other Apple binaries, there are some other functions bootstrap_look_up, bootstrap_look_up2, task_get_special_port, and bootstrap_register2. This gives a bit more context into the port/string mapping if you intercept them, however 75% of the messages still have unknown port names. XPC is an abstraction layer to send data between processes via mach ports. The lowest level functions emulate a key/value store (getters/setters for different data types). XPC has additional functionality which allows for transferring more complex objects like port’s/connections (xpc_dictionary_set_connection) as well as file descriptors (xpc_dictionary_set_fd) automatically. The way this is achieved, at the mach level, is including port descriptors in the XPC message. Since I didn’t know the source function, and I knew I was going to dive deeper into XPC, I spend a lot of time reversing the XPC [de]serialization routines and incorporated lookup XPC payloads into the name/port mapping. Now, I was able to see the full context of the messages that go back and forth. However, it doesn’t end there. Most interactions happen using XPC, and XPC is a bit more complicated that sending messages back and forth. Details on this will be in the following blog post.